The Irish government is desperate to lock Northern Ireland into the EU withdrawal deal, a leading economist and University of Cambridge academic has claimed. Dr Graham Gudgin, chief economic advisor to the think-tank Policy Exchange and also a visiting professor at Ulster University, believes political leaders in Dublin see the agreement as a “stepping stone” to a united Ireland. Dr Graham Gudgin, Cambridge University academic and former economic advisor to David Trimble as first minister. Commenting after Attorney General Geoffrey Cox was quizzed by MPs in the House of Commons yesterday about the legal implications of the withdrawal deal, Dr Gudgin said his answers came as “no surprise”. “He confirmed what is obvious from reading the agreement, that the UK will be trapped into remaining in a customs union and subject to other EU rules, essentially forever unless the EU agrees that we should be able to leave,” he said. Claiming that the Attorney General’s answers offered “no reassurance for unionists whatsoever”, Dr Gudgin said he believes there is no chance of Theresa May getting the deal through the House of Commons when MPs gather for the meaningful vote on December 11. 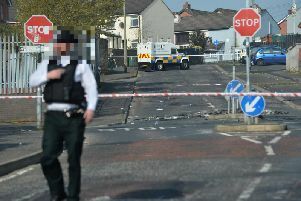 He told the News Letter: “The really interesting question is what happens then. Can the government get some changes to the agreement and then bring it back to parliament and get it through? “The key change they would need would be to take out the bit of the agreement which says we can’t get out of the backstop. They already have a paragraph drafted which never went to the EU, but it basically says the UK can leave the backstop if they find it unsatisfactory. “I suspect that’s what the government will try, but this is going to be very difficult, because particularly Dublin has been saying for two years they won’t accept any backstop which isn’t permanent. Voicing his party’s concerns in the House of Commons, North Belfast MP Nigel Dodds described the withdrawal agreement as “deeply unattractive and unsatisfactory” and said the Attorney General should be recommending that it be rejected. With the government having repeatedly refused to publish the legal advice it received on Brexit in full, Mr Dodds later revealed that the speaker of the House of Commons has been asked to launch proceedings of contempt. “We have now written to the Speaker to ask him to launch proceedings of contempt. Parliament can not be ignored,” he tweeted. Meanwhile, the Secretary of State has claimed the people of Northern Ireland “want the government to get on with it” and deliver the best possible withdrawal deal. Karen Bradley has been travelling around the Province over the past couple of weeks campaigning in support of Mrs May’s proposed agreement.